We would be honored if you are able to participate at one, or even a few of our events in 2019. Our conferences are educational forums that feature family offices and institutional investors like you discussing allocation strategies, risk management, direct investing, and many other pressing topics. Many institutional investors speak at our events to increase their peer connections, careers, deal flow, and awareness of cutting edge best practices. Each of these events will have 300-1,000+ participants and will feature 25-45 speakers per day. We keep sponsors to an absolute minimum and guarantee every person’s satisfaction or their money back. 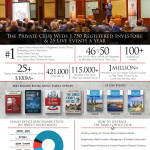 The Family Office Club is a ten-year-old event business which provides quarterly conferences and summits. Our team’s background is in financial services, media, and investments so we use our experiences and networks to craft conferences that appeal to our industry peers. Our family office speakers come from long-term relationships that we have built over the years, we rely on friends in the industry to deliver valuable presentations and join us for gatherings around the world. 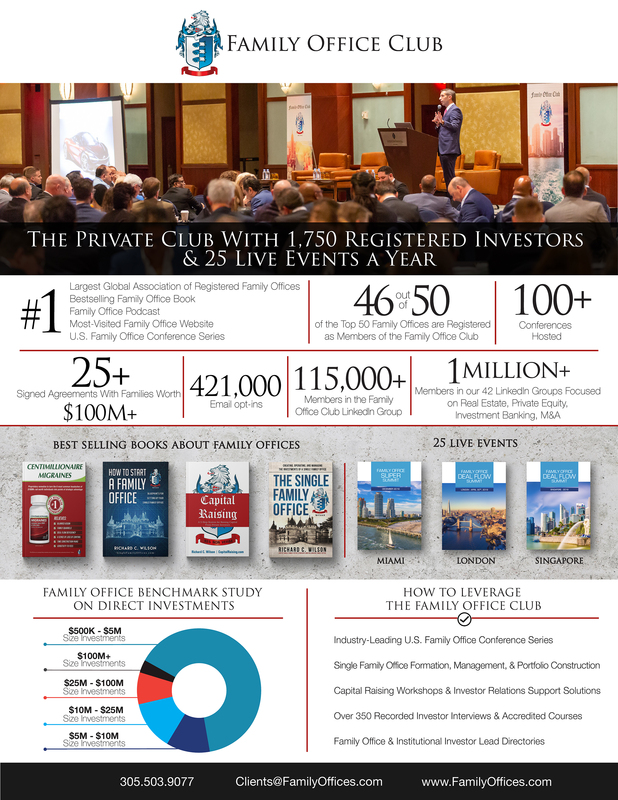 Our Mission at The Family Office Club is to bring together investment industry experts and executives to share insights on wealth management, family office best practices, risk management, direct investment deal sourcing, and alternative investments. Our audience includes institutional investors, family office executives, fund managers, investment professionals,consultants and a variety of family office industry participants. Our background is in the investment industry, and we recognize that the relationships you take away are almost as important as the content we provide. Unlike other industry events, we make a concentrated effort to facilitate introductions, partnerships, and open networking among everyone in the room. 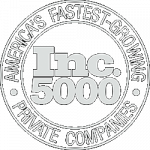 We have hosted more than 60 events to-date and we are always hosting large conferences at least every quarter. Deal Flow Sourcing: Manysiness owners, investment executives, and fellow investors you have a unique opportunity to explicitly state the type of deals you would like to see and how you would like to partner with members of the audience. Co-Invest & Start a Joint Venture With a Family Office Peer: Network with peers in the industry and identify opportunities to co-invest or joint venture with fellow family offices. We feature some of the biggest players in the industry and many times our speakers will find ways they can work together either on a private investment, a real estate transaction, or a joint venture. Networking Opportunities: Network with peers in the industry, build and reinforce strategic relationships and gain personal connections. As a speaker at one of Wilson Conferences’ events, you will be provided with an unparalleled opportunity to give presentations and network with other key opinion leaders in the field. Complimentary Access to the Conference: As a speaker at one of our gatherings, you will be provided with free admission to the conference ensuring that you not only have an opportunity to address the audience but you also get to participate and hear from other executives as they discuss other important issues through panel discussions, presentations and Q&A sessions. Market Your Firm: Our conferences attract institutional investors, family office executives, private equity dealmakers, investment fund managers, high-net-worth individuals, and a variety of family office industry participants. This multi-faceted marketing opportunity puts your company in front of a wide audience both at the event and through the promotion of the conference globally. As a speaker you will have your logo, company bios, website links, and brand featured on the conference website and associated marketing materials. We would love to have you join us as a speaker at one or even many events in 2019. If you are interested in speaking please fill out the form below and someone on our team will reach out. If you have any questions you can contact our Chief Operations Officer, KeAundra McIntyre at [email protected].